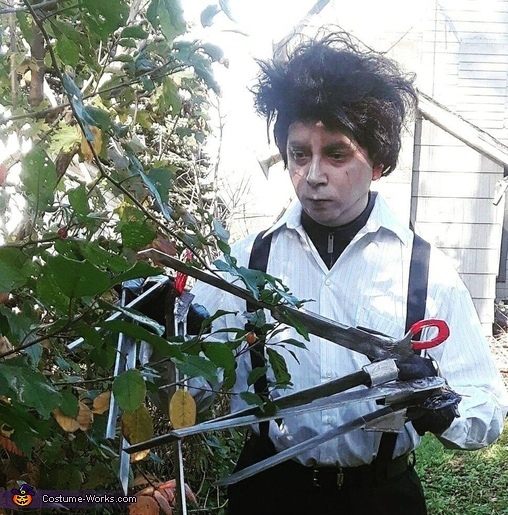 I've always wanted to try Edward Scissorhands, but I didn't have enough time for the all-leather-buckled look. So I went with the white shirt with suspenders appearance. I found the wig at my local costume shop, it was originally shoulder-length and very bushy. I trimmed it up, took modge podge glue to the tips, and used lots of hair spray. For the scissorhands I used an old black pair of gloves for the base. I found a template from a defunk'd website (can't remember the name for the life of me) for the scissorhand blades, then cut them out of foam board. I then took modge podge to the blades before painting them. Hot glue is my friend, which is what I use to glue the fingers of the gloves inside the finger cupped bases of the blades. I then added small details with foam pieces, and added bits of screws and plates to make them look mechanical. I used a make-up tutorial I found on Youtube from Alyson Tabitha. Turned out great.